The U.S. Department of Agriculture recommends daily consumption of fat-free or low-fat milk as part of a well-balanced diet — especially for kids. But evidence suggests that whole milk may be a better choice in some cases. Whether you're pouring it on your cereal, adding it to your coffee or drinking it straight from a glass, choosing between whole milk and reduced-fat milk can be confusing. Both whole and 2 percent milk offer benefits. By comparing the differences, you can make a choice based on your individual needs. Regardless of whether it's 2 percent or 3.5 percent whole milk, milk is nutritious. Your body needs the vitamins found in milk to use carbohydrates, protein and fat. All types of milk contain B vitamins, along with small amounts of niacin, pantothenic acid, vitamin C and folate. The content of fat-soluble vitamins A and D differs depending on the fat content of the product. Two percent milk must be fortified with vitamin A to be nutritionally equivalent to whole milk, according to Milk Facts. Whole milk typically has 395 IU of vitamin A, while 2 percent has 464 IU per cup. Most milk, whole or 2 percent, is fortified with vitamin D, making it one of the few food sources of this vitamin. Whole milk contains 98 milligrams of vitamin D, while 2 percent milk has 105 milligrams per cup. Your body needs minerals for enzyme functions, bone formation and oxygen transport. Milk is a good source of calcium, magnesium, phosphorus, potassium, selenium and zinc, according to Milk Facts. Two percent milk has slightly more calcium than whole milk with 285 milligrams and 276 milligrams, respectively, which is about one-third of your daily value, according to the USDA Dietary Reference Intakes. The phosphorus, potassium and sodium content is slightly higher in 2 percent milk as well. Milk also contains very small amounts of copper, iron, manganese and sodium. Read more: What Are the Side Effects of Milk? Energy value is calculated based on calories provided by protein, carbohydrate and fat present. Milk Facts says whole milk provides 146 calories, while 2 percent provides 122. Protein and carbohydrate content is basically the same in both types of milk — 12 grams of protein and 8 grams of carbs. The fat content is what sets full-fat and reduced-fat milk apart. Whole milk contains 8 grams of fat per cup, of which 4.5 grams are saturated fat. Two percent has a little less than 5 grams of fat, with 3 grams of saturated fat. Whole milk has a higher cholesterol content than 2 percent, with 24 milligrams, compared to 20 milligrams. Although 2 percent milk has more added vitamin D than whole milk, it's better absorbed in whole milk. A study involving children, ages 1 to 6, compared the effects of whole milk to those of low-fat milk. Results, published in the American Journal of Clinical Nutrition, indicate that the group drinking whole milk had higher levels of vitamin D and lower body mass than those who drank low-fat milk. 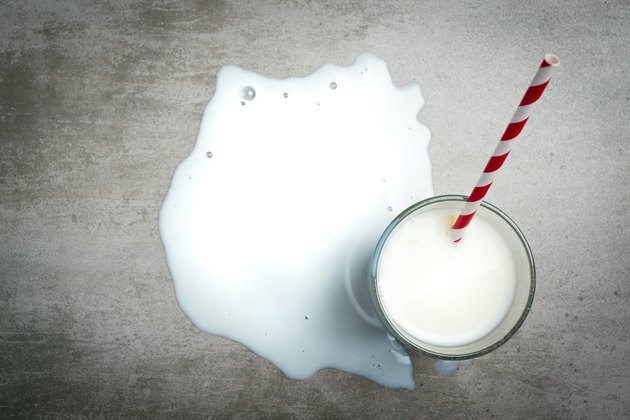 Researchers speculated that these findings resulted from vitamin D being fat-soluble and perhaps better absorbed when paired with the fat in whole milk. Also, whole milk is more filling, which could result in a lower calorie intake for weight maintenance. When choosing between whole milk and 2 percent for your weight-loss plan, you may easily assume that low-fat milk is better. But even though 2 percent milk has less fat and fewer calories than whole milk, there's evidence suggesting full-fat milk might be better for weight management. A study published in the American Journal of Clinical Nutrition in 2016 found that a group of middle-aged women with a greater intake of whole-fat milk had a lower risk of being overweight or obese. Those reduced risks were not seen in the group with low-fat dairy intake. If you're at risk for developing diabetes, you may be trying to decide if you should avoid whole milk and choose 2 percent or skim milk instead. Studies suggest dairy fat may be of benefit in reducing the risk of diabetes. A 15-year trial, published in the journal Circulation in 2016, found that people who had higher levels of full-fat dairy had an average 46 percent lower risk of developing diabetes than those with lower levels. The results also showed no evidence that low-fat dairy consumption was more effective than whole-fat.